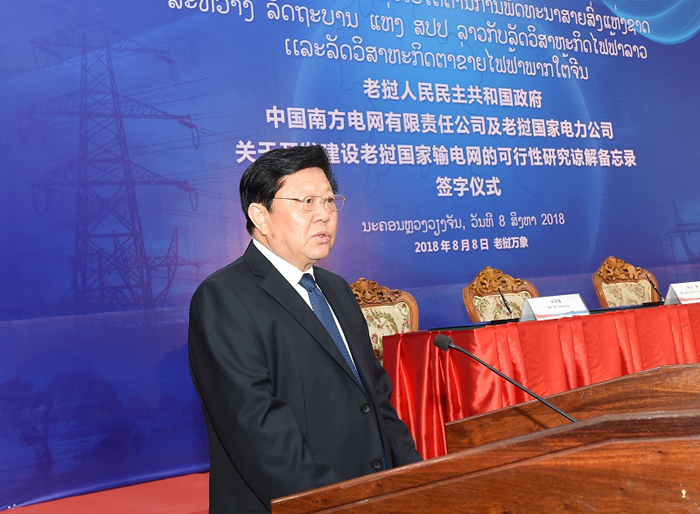 On August 8, the signing ceremony of the Memorandum of Understanding on the Feasibility Study for Development of National Power Transmission Line in Laos was held.Sonexay Siphandone, Deputy Prime Minister of Laos and Wang Wentian, Chinese Ambassador to Laos, witnessed the signing of the MOU. Li Qingkui, Board Chairman of China Southern Power Grid delivered his remarks and was a signatory to the new MOU along with Souphanh Keomixay, Minister of Planning and Investment of Laos and Boun Oum Syvanpheng, General Manager of Électricit�� du Laos (EDL). Before the signing ceremony, Li Qingkui, Board Chairman of CSG, expressed his sincere condolences to the victims of floods at a hydropower station under construction in Attapeu Province in Southern Laos. Mr. Li expressed his deepest sympathy to the families of victims and those impacted. 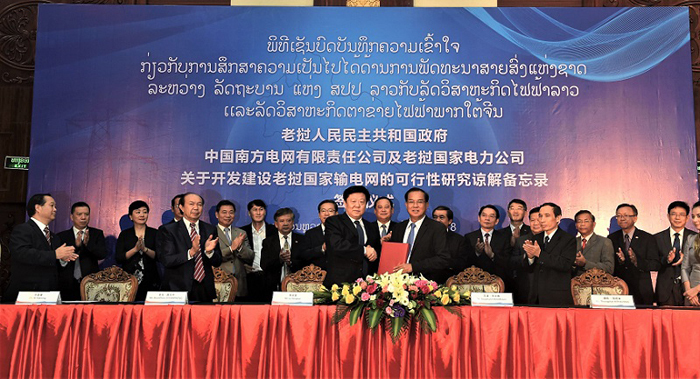 China Southern Power Grid donated 1.2 billion kips to the Lao government to assist impacted residents rebuild their homes. On August 8, the signing ceremony of the MOU on the Feasibility Study for Development of National Transmission Line in Laos was held here, serving as an important forward phase in implementing the MOU on Establishing Strategic Partnership in Power Development signed by China��s National Development and Reform Commission and the Ministry of Energy and Mines of Laos with Chinese President Xi Jinping and the Lao President Bounnhang Vorachit as witnesses, serving as a new milestone in the cooperation between China and Laos. Li Qingkui, Board Chairman of China Southern Power Grid, delivered his remarks and signed the MOU with Souphanh Keomixay, Minister of Planning and Investment of Laos, and Boun Oum Syvanpheng, General Manager of Électricit�� du Laos (EDL). Sonexay Siphandone, Deputy Prime Minister of Laos and Wang Wentian, Chinese Ambassador to Laos served as witnesses to the signing of the MOU. Mr. Li said, ��China and Laos, adjacent to each other, enjoy close cultural and people-to-people ties and a connected electric power grid. In this new era, China-Laos power cooperation is flourishing. CSG has rich experience in long-term power grid planning, construction and operation and has developed core power transmission technologies emphasizing long-distance, ultra-high voltage and large capacity��. Mr. Li added that with the signing the MOU, CSG ��will be dedicated to its cooperation with EDL, supported by various departments of the Lao government, so as to promote construction of these projects. In this way, we can contribute to economic and social development and people��s livelihood by providing them with safe, reliable and green power supply��. 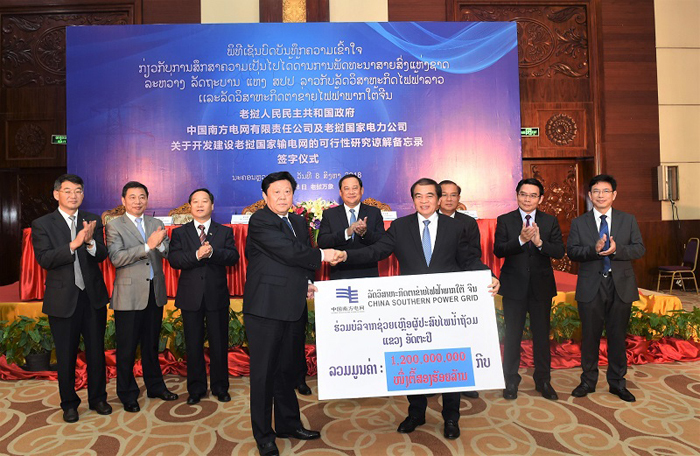 On November 13, 2017, the MOU on Establishing Strategic Partnership in Power Development was signed and governments on both sides agreed that CSG and EDL will tap into their respective advantages and cooperate with each other in investment, construction, operation and management of the backbone power grid in Laos. On July 16, 2018, Lao Prime Minister Thongloun Sisoulith authorized the Ministry of Planning and Investment to sign the Memorandum Of Understanding with CSG and EDL on the Feasibility Study for Development of National Power Transmission Line in Laos on behalf of the Lao Government. Prime Minister Sisoulith said, ��leveraging respective advantages and engaging in power cooperation featuring mutual benefits and win-win outcomes, we can advance the construction of an integrated backbone power transmission network here in Laos, thereby improving our nation��s transmission capacity and power supply reliability, promoting grid connectivity between Laos and our neighboring countries and building a platform wherein our hydropower advantages can be translated into an economic edge��. Recent floods at an under-construction hydropower station facility in Attapeu Province in Southern Laos led to several casualties as well as major economic losses. Prior to the signing ceremony, Mr. Li expressed his sincere condolences to the victims and deep sympathy to the families of the victims and those affected. On behalf of China Southern Power Grid, Mr. Li announced a donation of 1.2 billion kips to the Lao government to help those affected by the flooding rebuild their homes. 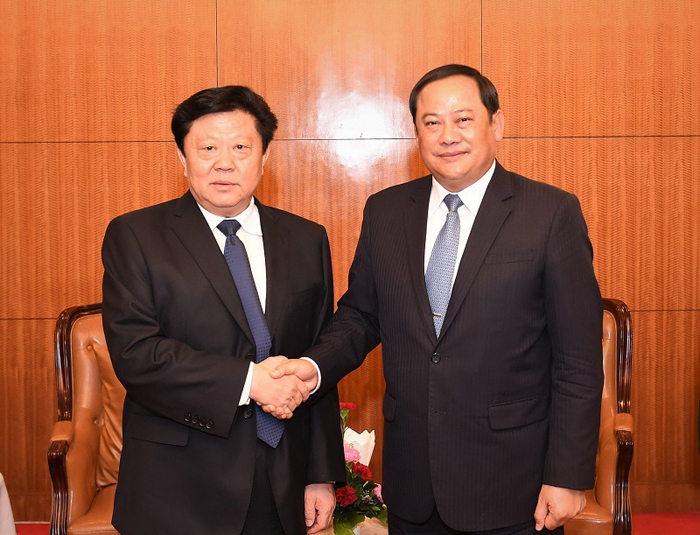 During his visit to Laos, Mr. Li also met with Sonexay Siphandone, Deputy Prime Minister of Laos and Wang Wentian, Chinese Ambassador to Laos and exchanged views on promoting varied ��Belt and Road�� construction, Sino-Laos relations and economic and social development. All parties expressed appreciation of CSG��s progressive role in making the signing of the MOU possible and the settled joint projects. Deputy Prime Minster Siphandone expressed his thanks to the Chinese government and to the staff and senior management team of China Southern Power Grid for their rapid and selfless assistance in recovery flood efforts in Laos.